As you look at our gallery of Kitchen Design Contest winners, you can’t help but be impressed with the vision and ingenuity of the designers and architects involved. What you may not always realize is how many problems they often have to solve to achieve perfection, working within various difficult constraints of the original kitchen space. This New Jersey kitchen is a prime example. While the footprint was sufficient to create the cooking, entertaining and relaxing space the homeowners wanted, they also wanted a bright and airy feel. How do you provide that when there are only two north-facing windows to work with? 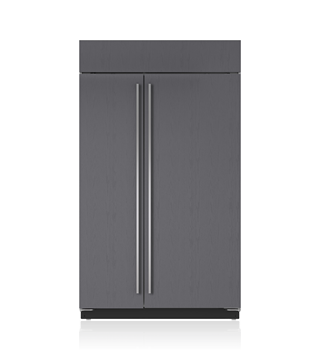 For designer Melissa Seibold, some of the choices were easy – light-colored cabinets and counters, for instance. Then, she enhanced the light quality throughout the kitchen with a combination of mirrors and glass. To the left of the range, she placed a piece of opaque glass in front of the mirror backsplash. In the water jet mosaic behind the range back, painted glass is employed again and intermittently dispersed between the marble for its reflective quality. Leaded glass doors echo the pattern of the backsplash. On the refrigerator wall, she again used leaded glass doors, as well as glass front cabinets. All these thoughtful details give the kitchen the light, airy feel the homeowners wanted. An easier challenge was satisfying the food preparation needs of the client, a serious chef and self-proclaimed foodie. Melissa relied on Sub-Zero, Wolf, et Cove: “Dual refrigeration ® and air purification keep various foods fresher longer, and that’s a must for busy families like this one, who typically only make one trip to the grocery store every week.” The flush mount capabilities of the refrigerator also gives the client the built-in look they wanted. 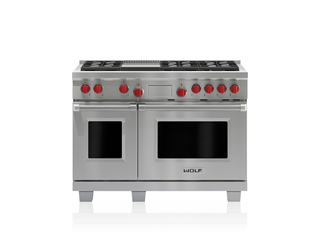 For cooking, only the 48” Wolf dual fuel range would do. “The dual convection system is an absolute dream to work with,” says Melissa. 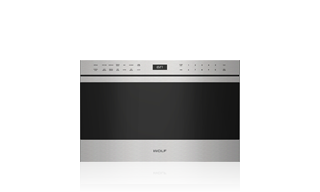 “Plus the griddle is great for the husband who loves to breakfast on the weekend with the kids.” The range also has a certain sophisticated elegance that provides an excellent anchor in this formal traditional kitchen.